Watch the video to learn how scientists used a combination of computer simulations and observations to determine how spicules form. Tracking the complex processes within these layers of the solar atmosphere requires instrument and modeling capabilities that are within technological reach for the first time. 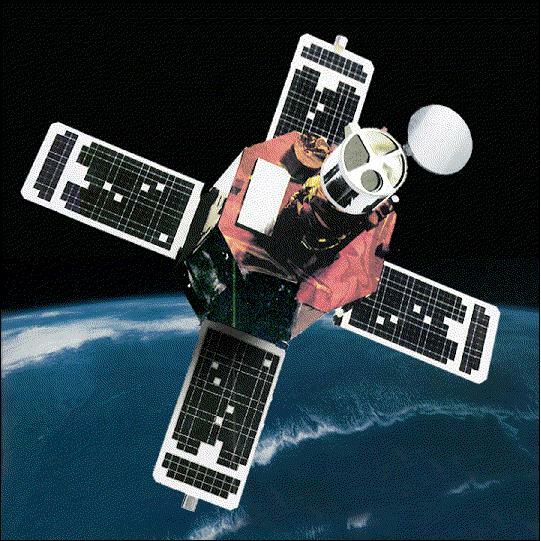 IRIS is the first mission designed to simultaneously observe the range of temperatures specific to the chromosphere and transition region at very high spatial and temporal resolution — going beyond earlier missions that were lower resolution or did not cover a wide range of temperatures. IRIS also draws on state of the art computer modeling sophisticated enough to deal with the complexity of this area. In combination, IRIS’s resolution, wide temperature coverage and computer modeling will enable scientists to map plumes of solar material as they move throughout the region and to pinpoint where in their travels they gain energy and heat. Which types of non-thermal energy dominate in the chromosphere and beyond? How does the chromosphere regulate mass and energy supply to the corona and heliosphere? How do magnetic flux and matter rise through the lower atmosphere and what role does flux emergence play in flares and mass ejections? The first results from a new NASA sun-studying spacecraft are in, and they reveal a complex and intriguing picture of Earth’s star. NASA’s Interface Region Imaging Spectrograph probe (IRIS) has observed ‘bombs’ of plasma on the sun, nanoflares that rapidly accelerate particles, and powerful jets that may drive the solar wind, among other phenomena, five new studies report. While spacecraft can enter planetary atmospheres, they cannot fly through the outer atmosphere of the sun, where temperatures reach 3.5 million degrees Fahrenheit (2 million degrees Celsius). Probes like IRIS instead must study the star from a safe distance. Unlike previous instruments, IRIS can take far more detailed observations of the sun, capturing observations of regions only about 150 miles (240 kilometers) wide on a time scale of just a few seconds. “The combination of enhanced spatial and spectral resolution, [which are] both three to four times better than previous instruments, allows a much closer look [at the sun’s atmosphere],” Hardi Peter of the Max Planck Institute for Solar System Research in Germany told Space.com by email. Peter was the lead author on a study of hot plasma ‘bombs’ on the sun. The surface of the sun, or photosphere, is the region visible to human eyes. Above the photosphere lie the hotter chromosphere and transition regions, which emit ultraviolet light that can only be observed from space. This is because Earth’s atmosphere absorbs most of this radiation before it reaches land-based instruments. The outer part of the solar atmosphere is called the corona. 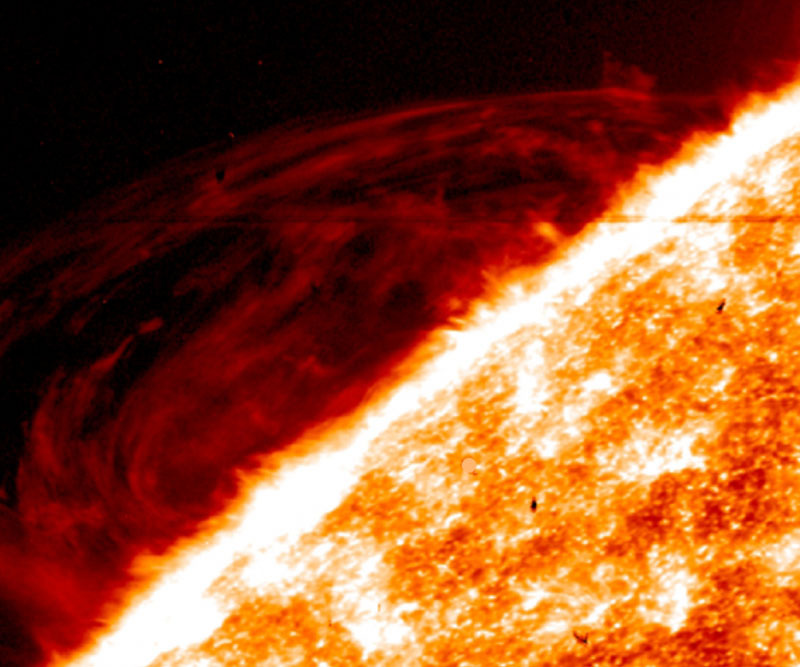 While much of the sun’s energy is generated in its core through hydrogen fusion, temperatures rise in the exterior layers moving out farther from the heat source. This means that something is powering that outer region, and scientists think the magnetic fields generated by the churning solar plasma provide at least part of the answer. “Nanoflares are short heating events releasing amounts of energy about a billion times smaller than large flares,” Testa said. Ultraviolet image of an active region on the sun, showing plasma at temperatures of 140,000 degrees. This image was captured by NASA’s IRIS spacecraft on Dec. 6, 2013. In the cooler photosphere of the sun, where temperatures reach approximately 10,000 degrees F (5,500 degrees C), the magnetic fields convert a huge amount of energy from the magnetic energy stored in the field into thermal energy, heating the plasma. According to Peter, the amount of energy released would be enough to provide electric power to Germany for 8,000 years. The change creates a pocket of gas heated up to 180,000 degrees F (100,000 degrees C) in the middle of the cooler surface region. These pockets, or “bombs,” eject plasma. Upward-moving material probably disperses into the hot corona, Peter said, while the downward-moving plasma is quickly cooled to reach the same material as the rest of the photosphere, blending back in to the surrounding material. Previously, scientists spotted no indications that energy-releasing events in the photosphere would result in the high temperature spikes in pockets within the photosphere. The energy output required to heat the dense gas was thought to be too high to be obtainable. “With these new results that show the existence of hot pockets in cool gas, we have to either revise the amount of energy that can be supplied deep in the photosphere, or we have to think of a clever yet unknown mechanism to heat the cool, dense gas rapidly to these high temperatures,” Peter said. In addition to disconnecting and reconnecting, the magnetic fields on the sun also twist. As the twisting field lines move away from the surface at 19 to 62 miles (30 to 100 km) per second, the nearby transition regions brighten to temperatures of up to 144,000 degrees F (80,000 C), far above the chromosphere’s average temperature of 7,800 degrees F (4,000 degrees C). IRIS’s detailed study of the sun revealed that the twists are far more widespread than suggested by previous studies. These twists occur in every magnetic region, both quiet and active. Observations of twists were made at IRIS’s maximum resolution, but other unresolved small-scale motions in the observations seemed to indicate the presence of even smaller twists in the field lines. Although the current data does not allow the scientists to determine the twists’ cause, IRIS science lead and first author Bart De Pontieu, of Lockheed Martin Solar and Astrophysics Laboratory, said that the twisting is most likely a signature of the so-called Alfven waves. These “magnetic waves [are] not unlike the waves that are generated after plucking a guitar string,” he said. The source of these waves also remains unknown. Another potential source could be the strong convective, or “boiling,” motions at the sun’s surface. 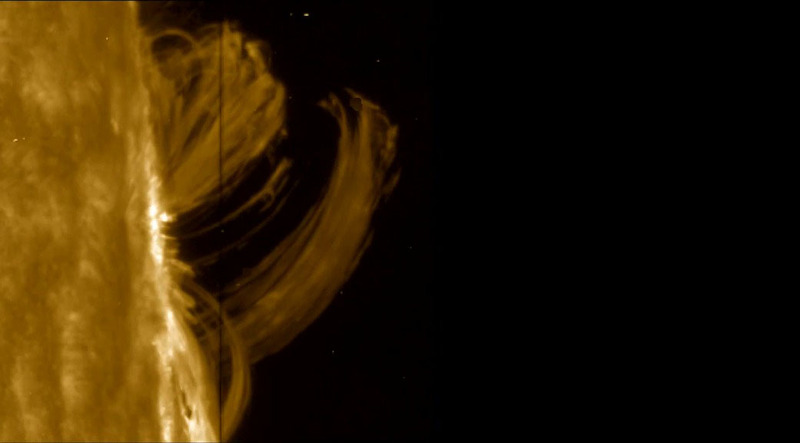 “Numerical simulations of the solar convection suggest that torsional [twisting] motions can be generated, kind of like when you drain a bathtub, and you see swirling motions as the water drains out,” De Pontieu said. “In particular, they provide support for models in which Alfven waves do much of the heavy lifting in the solar atmosphere,” he said. As the closest and brightest star, the sun has been studied throughout history. Based on indirect evidence from Skylab and other missions in the 1970s and 1980s, astronomer Uri Feldman, of the Naval Research Laboratory, proposed the existence of “unresolved fine structures” (UFS), an important solar atmospheric component in the transition region between the chromosphere and the corona. Using IRIS’s instruments, a team lead by Viggo Hansteen, of the University of Oslo in Norway, determined that a series of low-lying magnetic loops constitute these UFS, settling a decades-long debate regarding their existence. The loops of the magnetic field light up for short spans of time, perhaps a minute, when the plasma in the loops are heated, either due to magnetic reconnection or the dissipation of Alfven waves. During magnetic reconnection, plasma is accelerated to 2 to 3 times the speed of sound. Sometimes the loops form in isolation; other times they are concentrated in a nest of loops. The debate regarding the loops’ existence stemmed in part from questions about the plasma; scientists questioned whether or not all of the plasma in the transition region was thermally connected to the corona. The presence of the low-lying loops in the transition region confirms that plasma reaching temperatures of 180,000 degrees F (100,000 degrees C) are heated by from the loops rather than the corona. Although the loops themselves don’t heat the corona, Hansteen said that they are probably heated with the same mechanism, though with a different response due to their higher density. “It is likely that these differences will allow us to focus more clearly on the nature of the unknown heating events themselves,” Hansteen said. The solar wind drives particles and plasma from the sun through the solar system. When the particles collide with Earth’s magnetic field, they produce beautiful auroras, and have the potential to interfere with satellites and communication systems. But the source of the solar wind remains a mystery. The fast-moving solar wind travels hundreds of kilometers per second, carrying low-density materials. Previous instruments lacked the ability to study the small-scale regions thought to be responsible for the wind with the precision necessary to understand it. Scientists suspect that the solar wind originates from the bright network structures on the sun, appearing as bright lanes enclosing dark cells. These lanes flow outward from the sun, funneled by the magnetic structure, and eventually merge together into a single solar wind stream that flows steadily from the sun. A team lead by Hui Tian, of the Harvard-Smithsonian Center for Astrophysics, identified high-speed, intermittent jets in what scientists think is the solar wind source region, making these jets likely candidates for the initial stage of the solar wind. Rather than producing a steady outflow, the jets are sporadic, accelerating particles to speeds up of to 155 miles per second (250 km/s). “If these jets really are the nascent solar wind, then solar wind models must be updated to produce these intermittent, high-speed and small-scale outflows in the interface region,” Tian said. “If the answer is no, at least the impact of these jets on the still-not-observed nascent solar wind outflow should be carefully evaluated, because these jets are the most prominent dynamic feature in the believed solar wind source region,” he said. All five papers, along with a perspective piece by Louise Harra of the University College London, were published online today (Oct. 16) in the journal Science.